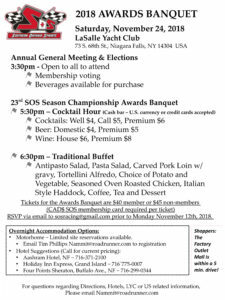 The Southern Ontario Sprints brings the 2018 season of racing to a conclusion with the final event for the year, the 23nd annual Championship Award Gala, where Corey Turner will be crowned SOS Champion. Events will begin with the Annual General Meeting from 3:30 pm to 4:30 pm. All members are encouraged to attend. Elections will be held for Executive and Board member positions. There will be discussions on the growth and direction of the future of the club and recruitment for the positions of Race Director, Track Marshall and Pit Steward. Any rule change proposals must be submitted to the board via e-mail at sosracing@gmail.com by November 14, 2018. 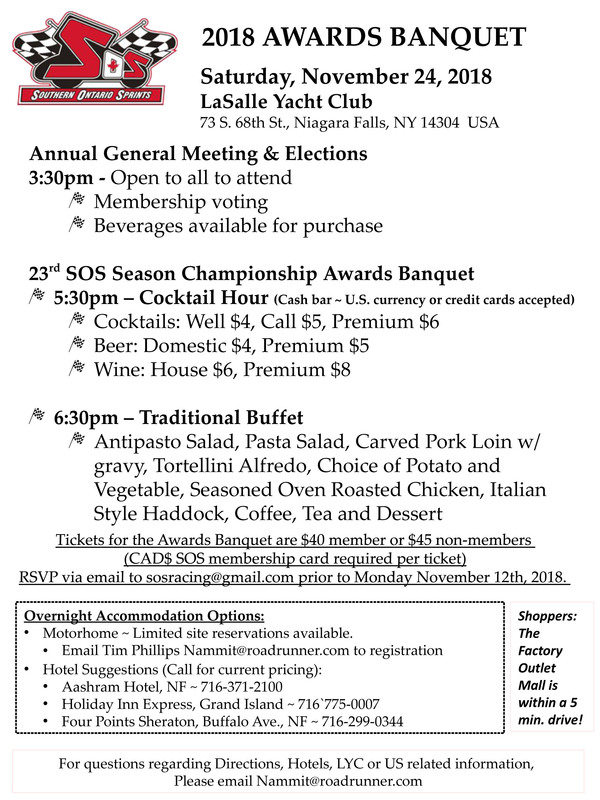 The SOS invite you to join us for an evening of fun and great food as the club recognizes this year’s Champion and Top 10 in championship point standings.